It’s gluten-free Almond Cranberry Muffins from Gluten-Free Homemaker today for March Muffin Madness! I love the way that Linda describes these soft, moist, and lovely muffins; how she combined flours and starches to create just the right weight and texture; and the mixing method she uses in her recipe to give her muffins such appealing features. 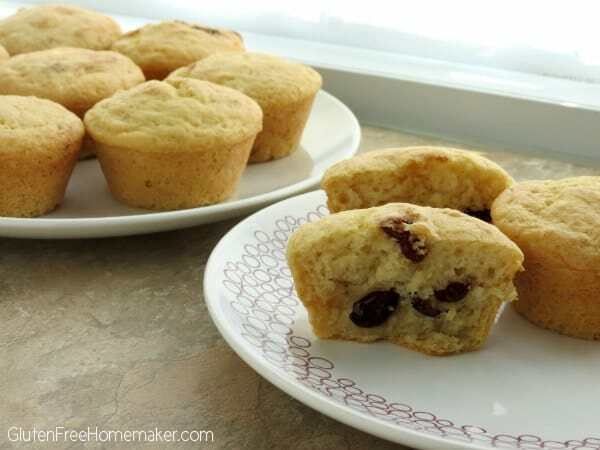 These gluten-free Almond Cranberry Muffins are another great addition to MMM and Linda’s information might even help you have the knowledge to create some of your own tasty muffins! Enjoy learning more about Linda and her Almond Cranberry Muffins and see the whole line-up of bloggers, blogs, and muffin recipes here. 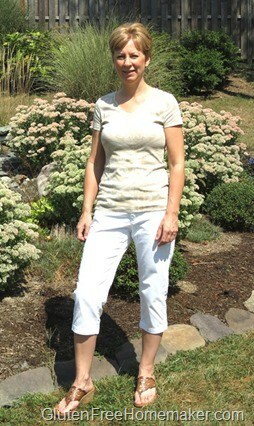 Linda began her gluten-free journey in 2000 when she was diagnosed with celiac disease. She found gluten-free cooking and baking to be both a challenging and rewarding adventure. Her desire to make life a little easier for others on a gluten-free diet led her to begin blogging at Gluten-Free Homemaker. 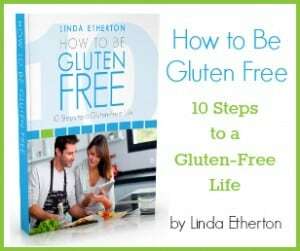 She also wrote the eBook How to Be Gluten Free: 10 Steps to a Gluten-Free Life to help those who are getting started with a gluten-free lifestyle. Linda’s ebook is really excellent. I recommend it for everyone who is on a gluten-free diet. If you’re new to gluten free living, you’ll learn all you need to stay safe and enjoy your gluten-free lifestyle. If you’ve been gluten free a while, you’ll still learn valuable info and get reminders on what’s key for being gluten free. Linda and I have been good friends for several years now. I was fortunate to be invited to an event with other gluten-free bloggers and Linda happened to be one of them. As I’ve shared before, truly the best part about participating in that event was meeting Linda and becoming closer “real life” friends over time. If you follow Gluten-Free Homemaker, you know how much helpful quality content Linda consistently offers there to the gluten-free community week in and week out. We’ve all come to depend upon her blog and all she shares there, but I have to tell you that as terrific is Linda is on her blog, she’s even more wonderful in person! Hopefully, some of you will get to meet her one day. Update: I had to come back and mention a few of Linda’s other recipes! That’s one of the main reasons her blog attracted folks in the first place and continues to bring them back. She excels at bread (and bread-based) recipes like her French Bread, French Bread Rolls, Calzones, Hot Pockets, and Pizza. But it’s her Angel Food Cake that all my friends and I rave over. She brought it to a retreat for us all to enjoy. It was the best Angel Food Cake I’ve EVER eaten. Period. Yes, that means the best of all Angel Food Cakes—both gluten-free and traditional, gluten-full Angel Food Cakes. Linda’s Sugar Cookies come in next (remember them when you’re doing your holiday baking!) and her Yellow Cake and Chocolate Cake recipes are not far behind in popularity. She has lots of other main dish recipes that everyone loves, too. Her Cheeseburger Fries are very popular and I was able to enjoy her Salmon Chowder when I visited not that long ago—filling and delicious, but not heavy at all. And now I’ll let Linda take it away! Hi everyone. 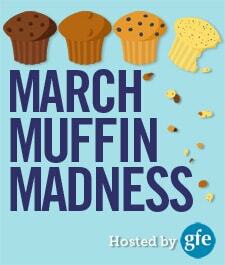 I’m so happy to be participating in Shirley’s March Muffin Madness because I adore both Shirley and muffins! These gluten-free Almond Cranberry Muffins were created before I went totally grain free, and they contain a mix of almond flour, sweet rice flour, and starches. The combination gives these muffins a wonderfully light and moist texture. And although they are not grain free, they are lower in carbs because of the almond flour. They’re perfect for my kids to snack on or grab for breakfast on their way out the door. They can handle more carbs than I can, but I know they’re also getting some healthy fat and protein from these muffins. Linda of Gluten-Free Homemaker has combined the right flours and starches to create these wonderful light and lovely gluten-free Almond Cranberry Muffins. In a large mixing bowl, combine the dry ingredients with a whisk. In a small bowl, lightly beat together the almond milk and eggs. Add the vanilla. Pour the coconut oil into the dry ingredients and gently mix with a fork. Add the milk, egg, vanilla mixture and mix by hand with a fork until mixed together and moistened. Stir in the cranberries or raisins. Spoon batter into a 12-cup greased muffin tin until cups are almost full. Bake for 18 minutes or until a toothpick inserted in the center comes out clean. Cool in the pan for five minutes then transfer to a wire rack to cool completely. Originally published March 14, 2014; updated November 13, 2018. They look so light and fluffy–the picture is gorgeous! still another delicious treat to try! Forget eggs, we are having muffins tomorrow a.m.
Can’t wait to make and try these! These look great… and I have almost everything needed in my kitchen! Oooh, these I’m going to try!! These look simple and delicious! I’m loving all theses muffin recipes!! They look so soft, as if they’d melt in your mouth and almond cranberry is a favorite combo. I’ve never tried sweet rice flour but these may have changed my mind. Looks good. I’m intrigued by the angel food cake you mentioned! Now I have sweet rice flour on my shopping list. I made a few of Linda’s recipes & have enjoyed all of them! Thank you! Those almond cranberry muffins look delicious! Pinning so I can try them later. Oh yummy!!! I love muffins… Cannot wait to try these!! All of the recipes I’ve made of yours have been fantastic and these look great as well! I love Linda’s website – her recipes are delicious! I like using almond flour, since I am gluten intolerant and my husband is diabetic. Now I have another blogger I can add to my list to find more recipes – thank you, Shirley! I can’t wait to try these yummy looking muffins! If these are as good as they look, I’m all in! Well I am getting quite a collection of muffin recipes and now another one to tempt my taste buds. I love muffins and love baking and sharing them. This one looks so good. These sound delicious! My list of muffins to make is getting longer…. love muffins and these look so good. Man, I’ve gone so far the other way I have no rice flour or potato starch in the house! But…I can modify these and I would never have thought of just a simple almond and cranberry combination. It sounds wonderful so thanks in advance for the good eating! This is definitely a keeper! I’m going to use this recipe. Linda is my favorite blogger! Thanks for sharing your recipes! I have several new ones to try now! They look so fluffy. That is what I really missed. I am going to replace the rice flour by almond flour, I think, or maybe hazelnut flour ( I like it with cranberries) and then I will give them a try. I’m not crazy about cranberries, but with golden raisins or maybe dried cherries and this would be delicious! Looks good! Does anyone know if xanthan gum is paleo friendly? Hi Michelle. No, xanthan gum is not paleo. While this recipe does use almond flour, it also uses sweet rice flour and other non-paleo ingredients. What a delicious flavor combination! This sounds like a winner. Love Linda! Can’t wait to try these. I have been successful on many of her other recipes. I love anything with cranberries! how well do these keep? fresh or frozen? I haven’t tried freezing them, and they go pretty quickly around here. They keep at least a few days. Yummy. I might have to try adding some orange zest. I love almonds and cranberries together. And yes, orange zest would be lovely! These sound like they would be great for thanksgiving! Looks yummy! Can someone tell me where/what the difference is in rice flour and sweet rice flour. I’ve never seen sweet, but I’m not sure where to look! Sweet Rice flour is another name for “glutinous rice” (not to be confused with glutenous). The flour is stickier and can result in a gummy texture if used in high amounts. Linda pairs it well with a drier almond flour to help things stay together but not gummy either. These really do look light and lovely! Wow, great photos! These look so light & fluffy! Cranberries are a bonus! 🙂 Thanks for the recipe! Cranberry almond biscotti is one of my faves, these sound like the muffin version 🙂 delish! I printed this recipe last year and just made them the other day. So good! I wonder how they would be if I replaced the almond milk and sugar with orange juice and orange zest? Any thoughts? I love the idea of adding orange to these muffins. I think the orange juice substitute would work fine, and orange zest would add great flavor. I don’t know about omitting the sugar, though. Not just because of the sweetness but because of the bulk it ads.